Perfect for the inspiration Susan! This is perfect! That pattern paper really matches the wallpaper! Ooooh! I love your multi-layered flowers, Susan! What a great card for the inspiration challenge…you even captured the window covering!!! Susan – wow – this looks great!!! BTW – Congrats on being in the DT for Flourishes!!! Classy and elegant! 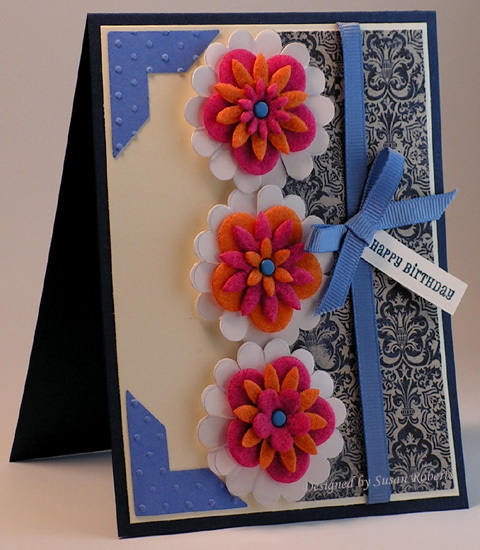 It is wonderful how you were able to pull the flowers, wallpaper and the colors in the rug from the inspiration piece and recreate them into this beautiful card. Awesome job!!! Your card is terrific! I love the many layers to your flowers!! Perfect!! Wow…this is so beautiful, Susan!! I love your gorgeous flowers and fabulous paper!! Oh wow! I love those flowers!!! Gorgeous card, Susan! BEEE-UUUU-TI-FUUUULLLLL!!! All I can say is WOW!! It’s beautiful. love those flowers!! Well… glad you ditched the simple because those flowers are gorgeous! Love it! Susan, I just got those felt flowers yesterday in my order and cannot wait to use them…I will be gone a few days, but after that I plan to make a card using them. I love your clean, crisp card…thanks for the inspiration, gf! FABULOUS!!!! No matter what you call it!!! Gorgeous card, Susan. I love the swiss dotted corners, the gorgeous paper and flowers. Sorry I was such a ditz and forgot your link. I added it now. I am so sorry about that. Outstanding, delightful, colourful, texture, bright, visually appealing. I could go on and on about this card. Love it! I just love this Susan!! The flowers are perfect! Congratulations on your DT with Flourishes too!! What a great card!!! Those flowers are so cool! Susan, you constantly amaze me! Your card is so pretty and just a joy to see! It looks very much like the inspiration piece. This is fabulous, Susan. I love the layered felt flowers. It may not be plain and simple but it’s PERFECT for the inspiration challenge – love it! Beautiful card, Susan! I LOVE your take on the inspiration!